Mike Caro adds penetrating insight and pro-level tactics to Doyle Brunson’s original Super/System — A Course in Power Poker, which he assisted in creating in 1977. As an enhanced-profit companion to the Brunson book that started the scientific poker revolution, Caro provides “stopping off places” where you can reference the guide for a world-class poker learning experience. This guide is full of secrets and big-money concepts and can be read as a standalone document, although it is better used in conjunction with Super/System. Printed report style with two book pages side by side. Twenty years after assisting Doyle Brunson with the creation of his landmark book Super/System — A Course in Power Poker, Mike Caro embarked on a major, closely related project. He was determined to add additional insight by finding stopping-off points in Doyle’s poker bible and by illustrating how these original Brunson teachings worked at today’s tables. The result was this powerful guide that enhances your journey along the path to poker profit. The trouble with a pair of queens before the flop in hold ’em and what to do about it. Page 70. How to make certain that your no-limit hold ’em bets are the right size to earn the most money. Page 80. Caro uses play-by-play hand illustrations to make proven, winning tactics clearer than ever! When is the time to tone down “poker poker” in favor of self defense? Page 21. Dozens more in-depth examples and explanations! Enormously profitable! It’s the perfect companion to Doyle Brunson’s Super/System. Or own Caro’s guide as a standalone poker course that will rush you to the next level. 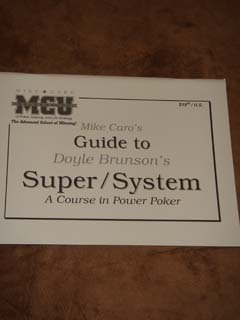 This all-Mike Caro super guide is must-have additional education for anyone owning Brunson’s original Super/System.